All transactions are safe and secure with a reliable history in online purchasing behind each of our associates. 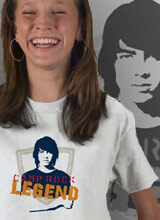 Buy the Shane Camp Rock t-shirt to own Camp Rock clothing and merchandise. Shane Gray might be a bit full of himself in the beginning, but he definitely learns a few life lessons along the way. This is thanks to his Connect 3 bandmates, Jason and Nate, who convince him to instruct the dance classes at the retreat. This Shane Camp Rock t-shirt displays an image of the legend himself. Wear it to ward off the evil diva Tess Tyler (Meaghan Jette Martin). Just make sure that Shane eventually knows your real identity. You might be able to convince him with a Demi Lovato Camp Rock costume, or maybe you should sing the This Is Me karaoke version to win his heart. In addition to the Shane Camp Rock tee above, browse the Camp Rock Clothing Gallery for more apparel like men's and women's clothes, kids shirts or hoodies.